Saturday, October 7, will be a day of rugby and Dartmouth revelry. The DRFC will take on Yale in the morning at 11:00am (First XV vs Yale followed by second XV). After the rugby matches, you can take in the Dartmouth-Yale football game (1:30pm kick-off) or visit your favorite Upper Valley spots. 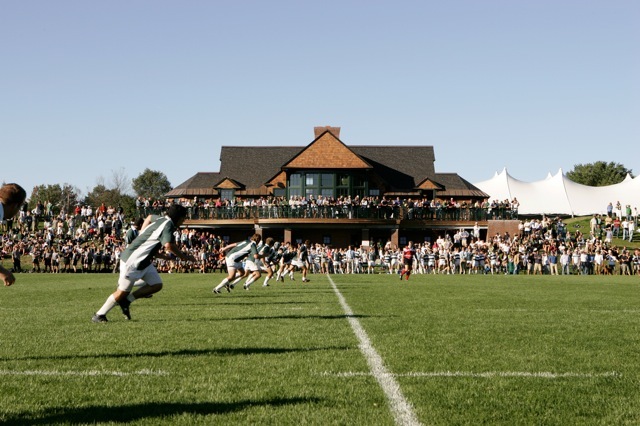 After the football game, return to the tent at the Corey Ford Rugby Clubhouse for a pig roast and celebration of the new inductees to the Wearers of the Green, the members of the 2011 and 2012 CRC Championship teams. The tent will open at 5:30pm. Catch up with friends and teammates, meet some of this year's players and hear some CRC tournament memories from the championship teams. The cost for the pig roast is $60 per person, catered by Maple Street with all the fixings including corn bread, beans, cole slaw, salad, watermelon, BBQ chicken, cookies and brownies. The bar will serve beer, wine and soft drinks. This is an at-cost event; please continue to support the DRFC with your seasonal Friends gift. If you plan to attend, please click the button below. If you missed the chance for the iconic DRFC sweater vest (see photo), they are now for sale! Share your alumni spirit and sponsor a player for $25. PS. We will also be holding the semi-annual meeting of the full DRFC Board of Governors the next morning in the Clubhouse at 10:00am - as always, all are welcome to attend.